Ahhh, Point Break… so classy, so Keanu. I’m here… I’ve got my (homemade) hot cocoa and I’m hanging on by a thread… but I’m here. You don’t want to hear about the wall of fatigue, the dizzy spells that are more constant than not, the stomach problems… so I won’t go there. Suffice to say I feel like I’ve just been sort of existing. Hopefully a visit to the GP on Monday will shed some light. In the meantime, surfing! Waves! Wipeouts! Overuse of exclamation points!!! 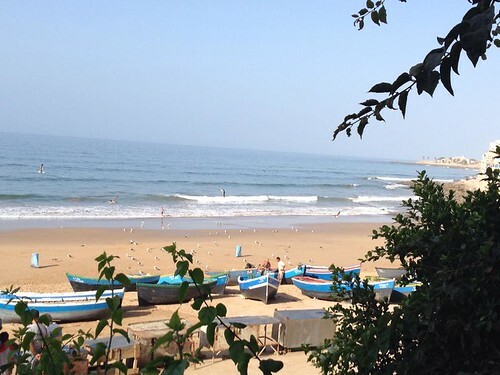 H and I (of triathlon fame) had come up with the idea of a long weekend away a while back and somehow, what I envisioned being a nice, relaxing spa weekend turned into six days in Morocco. Surfing. 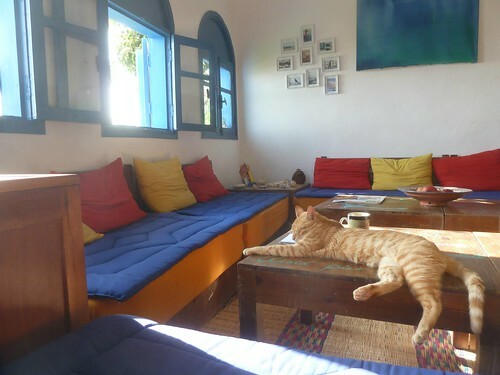 And not even in a major city–in a little fishing village outside of Agadir called Taghazout. If you know me, you know I’m pleasantly plump and (of late) fairly lazy. 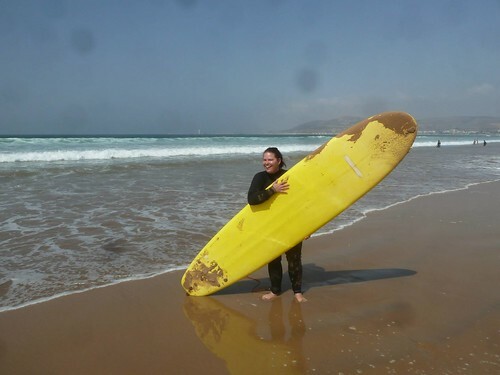 I knew surfing was going to be a challenge… much less doing it in a country I’d never been to. Would there be clean water? Terrorists? Ebola? Thankfully, my overdriven, panic stricken brain was just that–and very mistaken! Well… apart from the flight to Agadir. That was slightly hellish, particularly for a nervous (though frequent) flier. Full disclosure, H took most of the photos as I was a lazy bum and only brought my iPhone and no camera. Those aren’t clouds… that’s the fog. So there was this monster fog over Agadir. It was so thick and so widespread that, after circling the area for around 45 minutes, the pilot decided he didn’t feel that the situation was safe enough to attempt a landing and he didn’t ‘trust the airport enough’ to go in with limited/no visibility. Fine. So we flew to Marrakech (about 3 hours away by coach). We circled Marrakech for a bit. Again, the pilot comes on. 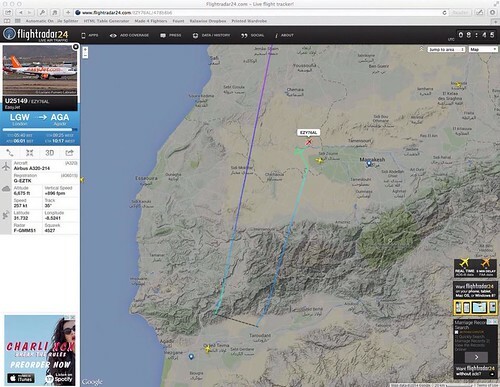 There was an emergency situation in Marrakech and a plane had been evacuated on the runway, so the airport was closed. Hm. After a few minutes the pilot comes back and said we were going to try and land in Casablanca (“of all the gin joints…”). We get to Casablanca and (after some turbulence over the Atlas Mountains) land safely, despite it being pretty foggy there as well. I guess maybe they trusted this airport more? After sitting off to the side of the airfield for a bit the pilot said we were being bussed to Agadir. And people went crazy. Mental. It was pretty intense… considering it’s a 12 hour coach ride. Passengers were getting very aggressive and confrontational with flight staff and it was all really ugly–almost made me sad to be a human, really. One guy who was, without embellishing, drunker than anyone has any right to ever be, was shouting in various languages and tried to run up to the front of the plane. He threatened staff and, from what I understand, used the word “bomb” a few times. Obviously a no-no. Cue the Moroccan police who quickly boarded the plane and arrested Mr Drunk-man and his bags were offloaded. 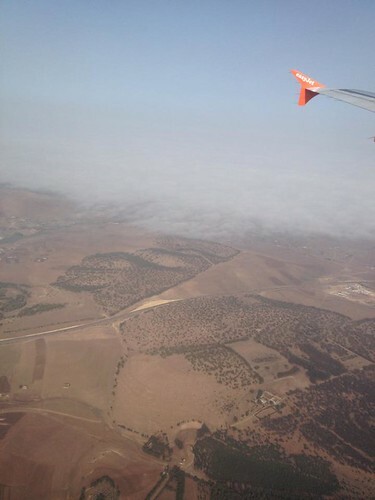 After all of that carryon, the pilot came back on and apologised and, in a stroke of luck, said that the fog in Agadir had cleared somewhat and despite it not being normal procedure, they were going to re-fuel and take us on to Agadir. Hurrah! I think (without tooting my own horn) I handled the flight debacle quite well. I didn’t cry/scream/pass out/go into hysterics. Other than a really strong rash of turbulence during which I latched on to H for dear life, I was fine. What could I do? So our holiday got off to a weird start. We landed in Agadir, went through passport control where my passport was very much scrutinised and collected our bags virtually hassle free. I nearly got cheated out of half of my spending money by a slightly forgetful (or dodgy) bureau de change employee–thankfully I was switched on enough to notice or else I would have been out over 1,600 dirhams (£120). We passed into arrivals and it was like a hallelujah seeing a guy holding a sign for our hotel/surf camp. The ride from the airport was fairly uneventful.. I say that like driving in Morocco in general is uneventful. It’s not. They’re all manaic speed demons and seat belts are a luxury, not a law. 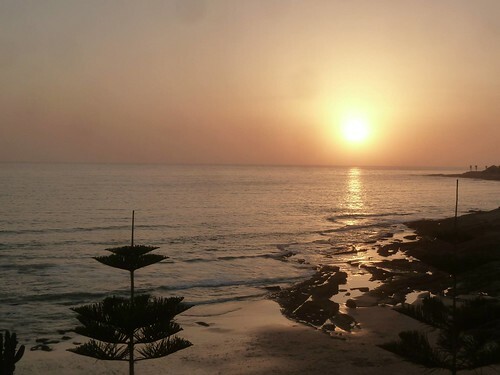 Regardless, we made it to Taghazout unscathed and were dropped off at the top of a series of stone steps leading down an alley to our hostel, l’Auberge–owned and run by the brilliant Surf Maroc crew. H and I had sprung for the triple bed room with ensuite (one of the only ensuite rooms) and paid extra to keep the third bed empty. Right choice. It was great not having to worry about strangers in the room and having our own bathroom/shower was a plus as well. There was a house kitty!!! He was everywhere all the time. It was so nice falling asleep each night (and for our afternoon siesta) to the sound of the waves crashing on the beach below. On to the most important bit! The surfing! 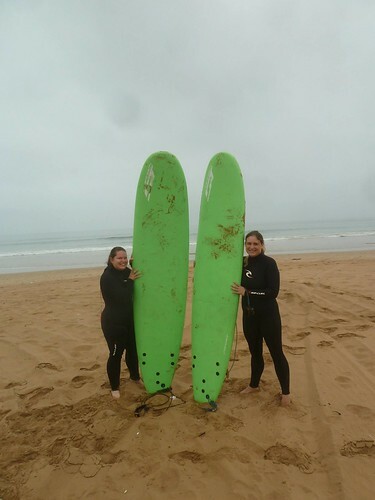 I have to say, Surf Maroc’s surfing instructors were brilliant. We’d booked four lessons and my only goal was to stand up once by the end of the last lesson. 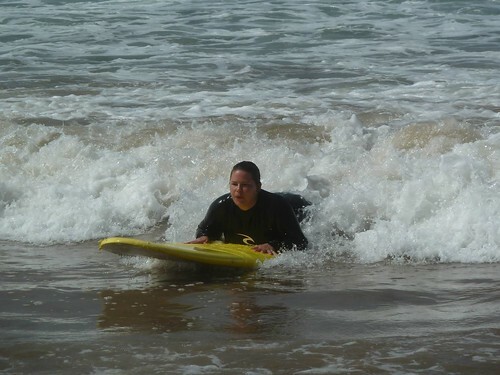 H took to surfing really quickly and looked like a pro by the end of the first day. Me on the other hand? Less so–again, I’m not really athletic and my balance is shocking on a good day. Negativity aside, I like to think that I challenged our lovely instructors. Each day ran virtually the same. Breakfast at 8, pickup by instructors at around 9 (hey, we’re on surf time) and on the beach no later than 10:30. Our instructors made sure that we had the right beach/waves for our skill level (all beginners) so occasionally we’d get to one beach only to move to another straightaway. It was fun squishing up in the sand filled vans, music blaring and wind in our hair. There was a sense of freedom which was very appealing! Lessons consisted of a warm up followed by board work on the sand, each of us demonstrating our technique and taking on pointers from the instructors. Finally, they’d let us loose in the water, working one on one with each of us. I think I might have gotten a bit more attention on days three and four, purely because I hadn’t stood up on my board yet. Finally, on the last day, my instructor told me to get over my fear of falling, put my mind to it and just stand up. And I did! A few times! Not for long, but long enough to be noticed and to get cheers from a few of my fellow surfers. Everyone was so lovely and supportive. After a couple of hours in the water, we sat down to packed lunches and then had the choice to go back out or to chill on the beach and sunbathe. I’ll be honest, I mostly took the second option. There was no way I was coming back from Morocco with a wetsuit tan!! Beyond all of that, there wasn’t much of note that happened… other than the goat men. The weekend we were there was Eid-al-Adha, a big Muslim holiday. There are two Eids each year and this particular one is known as the Festival of the Sacrifice–commemorating Abraham’s willingness to sacrifice his only son to God. Families purchase goats (we saw loads of them being dragged down the street), have them blessed and then slaughter them, giving 1/3 of the meat to neighbours or friends, 1/3 to the needy and keep 1/3 for themselves for the feast. It’s all very interesting and on the Friday night the mosque in Taghazout blared the prayers over the loudspeaker at dinnertime (the call to prayer was also played daily). As I listened, I honestly felt like I was in a whole different world. 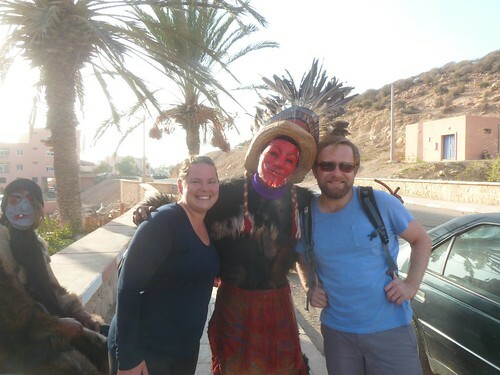 So in Taghazout, after the feast, young men use the skin of the goats and dress up in scary masks and roam the streets. If you give them change, they give you a blessing. If you don’t, they wish a curse upon you and (as some of my fellow hostel mates found out) they’ll smack you with a bit of rope. Luckily we only got caught once by them and I had change. They insisted we pose for a photo. Gareth (out walking with us) got pulled in for the photo as well. I can’t even tell you how bad my shirt smelled after. Let’s just say you could tell those goat skins were relatively fresh and untreated. 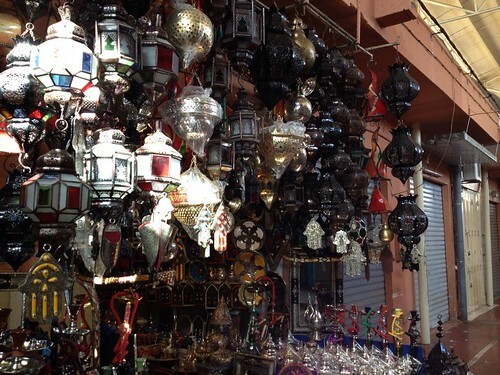 On the day we flew out, we did venture into Agadir on our own to go to the souk. I came home with so many amazing spices, a lantern, a gorgeous throw for our bed and a few gifts for other people. 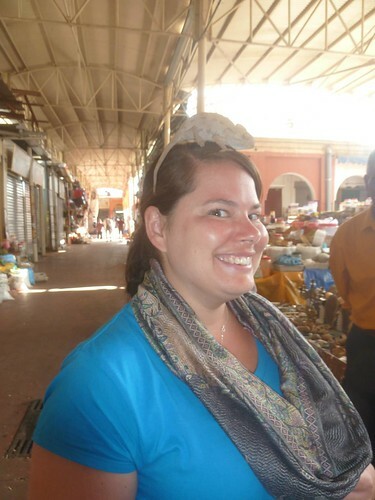 While there, I did have the pleasure of having a chameleon placed on my head by a very friendly vendor. I think that’s the bulk of the trip! 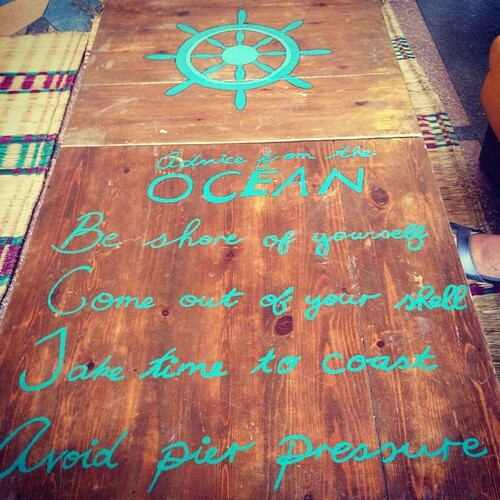 I would wholeheartedly recommend Surf Maroc‘s accommodation, their yoga classes and their surf coaching. The staff were brilliant and made us feel so welcome. I’m so glad that I got stuck in and went with H on this trip… I had an absolute blast and definitely am thankful for such a diverse and out-of-the-norm experience. I’m so jealous of your getaway! Learning to surf is on my bucket list, but I’m afraid I won’t even be able to stand up on the board, especially since I’m a little plump myself. 🙂 I’m glad you had such a great time! Oh, and I wish the FBI would pay us to surf! awesoome in favor of me. Thank you for another informative site. Where else could I get that type of information written in such a perfect means?